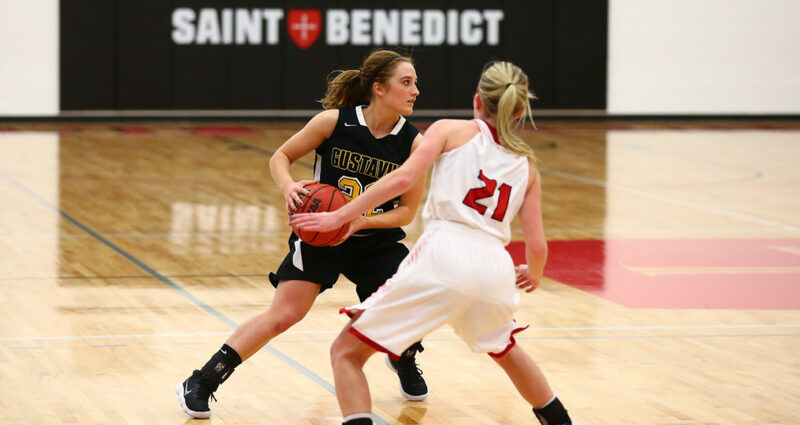 ST. JOSEPH, Minn. – The Gustavus women’s basketball team opened MIAC play Saturday afternoon at Saint Benedict, losing 64-61. The loss drops the Gusties to 3-4 overall and 0-1 in the MIAC, while the Bennies improve to 3-3 overall and 1-0 in the league. For the second straight game Gustavus struggled from beyond the arc, making just 1-of-14 three-pointers, which proved to be the difference in the outcome. The first quarter featured four lead changes with the fourth one going in favor of Saint Ben’s, which proved to be the last. The Bennies finished the opening quarter on a 7-4 run to take a 17-14 lead and never trailed the rest of the game. The home team’s largest lead was 45-30 with 6:32 remaining in the third quarter before the Gusties staged their comeback effort. Gustavus cut the lead in half to finish the third frame and brought the score all the way down to one point at 62-61 with 14 second left in the game, but a pair of Bennie free throws extended the lead back to three and the last-second shot was no good. Paige Richert (So., Comfrey, Minn.) led the Gusties with her first career double-double at 16 points and 11 rebounds. Justine Lee (Sr., Dawson, Minn.) reached double figures as well with 10 points. Gustavus shot 39.7 percent from the field and lost the rebound battle 33-30. The Gusties shot well from the charity stripe, making 14-of-16 free throws. Gustavus returns home next Wednesday night for a MIAC matchup against Macalester.